Photographs and aerial video footage above Medford Lakes on Monday afternoon showed the aftermath of a disturbing multi-school bus crash. Photographs posted by the Medford Lakes Fire Department showed four buses lined up behind one another, and each bus appeared to have significant damage to the front and rear bumpers. 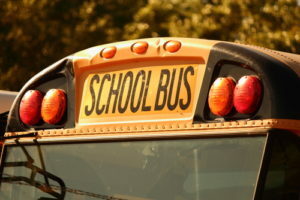 A fifth school bus can be seen across the street. While nothing has been confirmed by police reports, it appears that the school buses rear-ended one another in a chain reaction accident. Investigators have not commented on who or what may be at fault for this crash. Reports confirm that around 88 students were aboard the buses when the rear-end collisions occurred. Most of the children, about 67, were cleared to return home, but 21 students were promptly taken to nearby medical facilities with personal injuries. When you and your family are facing medical bills, prescription costs and missed time from work and school dealing with the aftermath of an accident, it’s within your legal rights to seek out compensation for these losses. Accidents are avoidable, and nearly every motor vehicle collision is caused by negligence. An experienced personal injury attorney will help collect the evidence necessary to prove fault, quantify the extent of your injuries related to your claim and maximize your overall compensation award. TeamLaw’s squad of expert attorneys have been doing just that for over 60 years. If you’ve been involved in an automobile accident, then don’t hesitate to contact our firm online for more information.